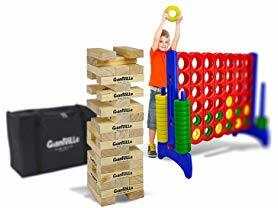 Today ONLY - Check out these Giantville Games $49.99 - $174.99. •Giant size 4-in-a-row: bigger is always better with this Super Size Link 4 game. This giant version of a classic measures 3 and half feet tall, and four feet wide. Kids and adults will love it! •Great for parties: make any event a blast with a game that no one can resist getting in on the action. •It is perfect for birthdays, beach days, sleepovers, backyard BBQs, and more! •So much fun: let the games begin! The aim of this classic game is to be the first to connect 4 pieces in a row in any direction. The colorful oversized pieces really bring the game to life! •Easy to use: it is simple to assemble this floor toy in just a minute with the included instructions. A lever empties all the game pieces to restart, and disassembly and storing is easy too! •Interactive: have a blast while you test your brain skills, hand eye coordination and improve your critical thinking. Great as a two Plater game or with teams. 42 game pieces included.